It’s hormone month at The Quiet Branches. It makes a little sense now that I think about it. Love is supposedly in the air with Valentine’s Day and the plants that go dormant for winter will soon be back, engaging their hormone pathways to sprout new growth. In a way, I hope I’m teaching you part of what’s behind the plant product you receive on Valentine’s Day, if you’re so lucky to receive something. And this week’s post has deep evolutionary roots, perfect to celebrate Darwin Day on February 12. 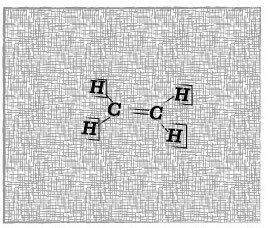 The ethylene molecule. The simplest Olefin. C = Carbon, H = Hydrogen. The basis for the saying “one bad apple spoils the bunch” (it’s a true aphorism!) is a hormone with ancient evolutionary roots: ethylene. Most commonly, it is known as the “fruit ripening hormone”. You may have heard it’s possible to get fruit to ripen faster if you put it into a sealed bag. Fruits produce varying amounts of ethylene, and by enclosing it in a small space, it has a greater effect since gasses fill the container they’re in. This gas that plants produce is a signaling molecule, a hormone. Like auxin I wrote about last week, it has a receptor, signaling pathway, is made by the plant and is involved in a lot of plant processes. In various ways, people have been artificially ripening plants for a long time. Egyptians apparently wounded figs to induce aging that causes a release of ethylene(Wikipedia entry on ethylene). And in China, incense burned in an enclosed room could also age fruit. Combustion produced a sufficient amount of ethylene for changes to occur (Wikipedia entry on ethylene). Hints that ethylene was the molecule responsible for affecting plant growth first appeared in the 19th century when people noticed that pipes leaking gas used to fuel street lamps caused growth defects in nearby plants and green houses. This “illumination gas” caused thickening stems, stunted growth, and twisting (Wikipedia entry on ethylene). People did narrow down the chemical class responsible: olefins, of which, ethylene is the simplest member1. When modern plant scientists started studying ethylene, using seedlings grown in the dark was used as an assay because they show a particularly dramatic ethylene response. They have shorter roots, shorter and thicker stems, and an exaggerated ‘apical hook’. Ethylene is also involved in abscission in many plants, meaning the dropping of leaves or fruit from the plant1. Plants can show responses to quite small amounts of ethylene, down to 0.1 parts per million, and probably lower1. It may seem odd or counter intuitive that a gas could be used as a hormone or a signal for plant cells to communicate information. However, it does make some sense. Ethylene is a simple molecule and gasses are quite mobile and can spread not only internally, but to neighboring plants as well. And then, it’s just one thing the process of evolution incorporated into plants. How plants respond to ethylene has implications for agriculture. A particularly interesting example is flood tolerance in rice. Rice growing regions are prone to flooding and most varieties of rice are negatively impacted by prolonged flooding. A natural variety of rice, dubbed Sub1 was discovered that could resist a flooded state and recover well for up to two weeks (see video below)2. The genes underlying this trait turned out to be genes that are turned on in response to ethylene2. Plants make more ethylene when submerged. Thus manipulating ethylene signaling can help feed the world. As can manipulations of other hormones since hormones interact with one another to affect plant cell and whole plant responses. The origins of ethylene perception in plants is a truly ancient one. There is evidence to support the origin of the ethylene receptor, the gene that codes for it, exists in photosynthetic bacteria (aka cyanobacteria)3. One type of cyanobacteria is thought to be the origin of chloroplasts, the sites of photosynthesis in plants. This is the endosymbiont hypothesis in action. Basically a cell that was not green swallowed a photosynthesizing bacteria and that green bacteria took up residence in that cell. The relationship proved fruitful for both cells in terms of reproductive success and over time, the bacteria shuttled a lot of its genome to the genome of the cell that swallowed, including that ancestral ethylene receptor. As far as I know, that’s the origin of the receptor for ethylene, not other genes known to be in it’s pathway in modern plants. The rest of the signaling network evolved into a pathway over time. I am also not sure the function of the cyanobacterial ethylene receptor is fully known. A 450 million year-old “middle step” in the ancient origins of ethylene responses was recently explored by a paper published in Nature Plants from the labs of Caren Chang and Charles Delwiche at the University of Maryland4. Figure 2 excerpt from Reference 4. Panel d shows Spirogyra algae after air and ethylene treatments. Panel e quantifies the response showing the algae responds to quite low concentrations of ethylene. Panel f shows that the response can be blocked with an inhibitor of ethylene, 1-MCP. The researchers reported identifying components of signaling, synthesis, and perception of various hormones (ethylene, abscisic acid, auxin, brassinosteroids, and cytokinins) in several species of aquatic green algae4. They accomplished this by generating libraries of expressed genes for these and other algal species. These fresh water green algae, the Charophytes, are ancestors of modern green plants. The researchers show that the algae responds to ethylene with cellular elongation (see image below)4. And they could block the response with an inhibitor of ethylene signaling4. That function of increasing cell elongation still exists in plants today, though ethylene also inhibits cell elongation in many cases, suggesting novel roles have evolved over time. 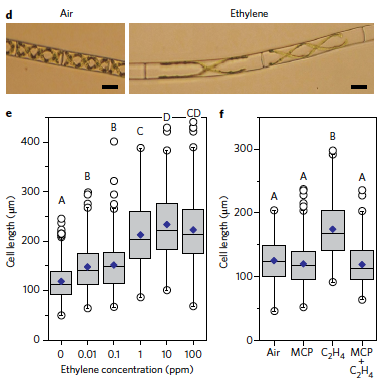 And last, the researchers show that the algal versions of ethylene signaling can partially replace those of a modern plant showing that they do indeed perceive ethylene4. It is amazing that so many hormones have origins in algae. The hormones that weren’t there may have evolved when plants colonized the land, became multicellular, and had new challenges to address. The story of plant hormones continues next week. 1. Doubt, S. (1917). The Response of Plants to Illuminating Gas. Botanical Gazette, 63(3), 209-224. 2. Jung, K., Seo, Y., Walia H., Cao, P., Fukao, T., Canlas, P.E., Amonpant, F., Bailey-Serres, J. and Ronald, P.C. (2010). The Submergence Tolerance Regulator Sub1A Mediates Stress-Responsive Expression of AP2/ERFTranscription Factors. Plant Physiology 152(3), 1674-1692. 3. Mount, S. M., & Chang, C. (2002). Evidence for a Plastid Origin of Plant Ethylene Receptor Genes. Plant Physiology, 130(1), 10–14. 4. Ju, C., de Poel, B.V., Cooper, E.D., Thierer, J.H., Gibbons, T.R., Delwiche, C.F., Chang, C. (2015). Conservation of Ethylene as a Plant Hormone over 450 Million Years of Evolution. Nature Plants, 1 (article no. 14004 (2015).